Have you seen the cute pinata type cupcakes? The cupcakes with a surprise in the middle? 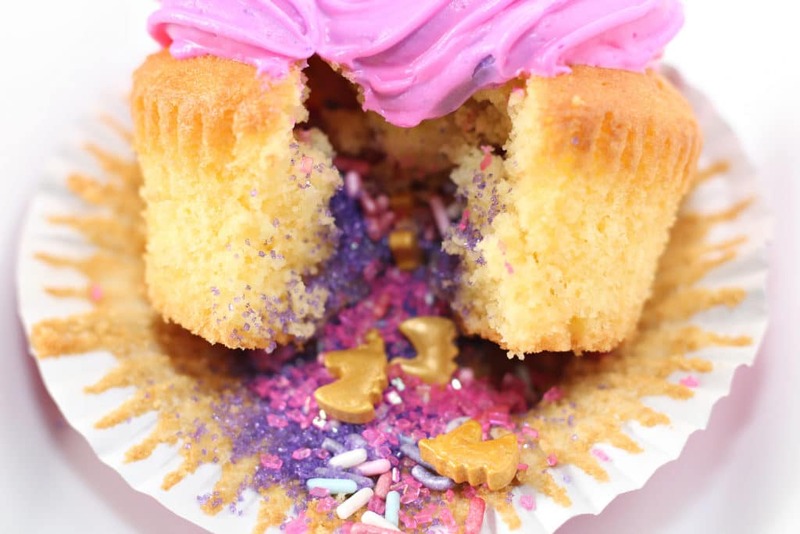 These unicorn cupcakes will thrill anyone who loves unicorns. Unicorns are everywhere right now. For a unicorn lover, there are so many ideas for unicorn crafts, unicorn treats, and unicorn toys. These unicorn cupcakes are the perfect addition to any unicorn lovers birthday. Unicorn Cupcakes are cute all on their own, but when you make cupcakes with a surprise in the middle, cupcakes take on a whole new level. Cupcakes with surprise in the middle often called pinata cupcakes or confetti cupcakes, are fun for a child’s birthday party or for a special occasion. With almost no effort, it is easy to turn regular cupcakes into pinata cupcakes. 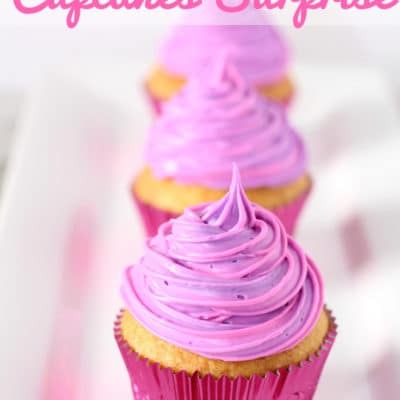 Creating cupcakes with a surprise in the middle might seem like it would be complicated, but it is extremely easy. This is a fun thing kids can do. 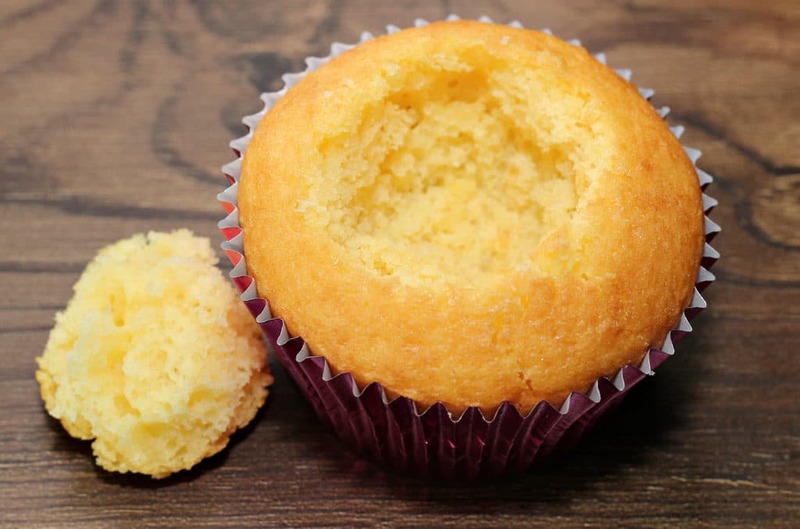 To make cupcakes with a surprise in the middle, wait until the cupcakes are cooled. Cut the center of each cupcake and place aside. Use a spoon and scoop out the middle. You will want to go about halfway down. Use your finger to clean out the hole. 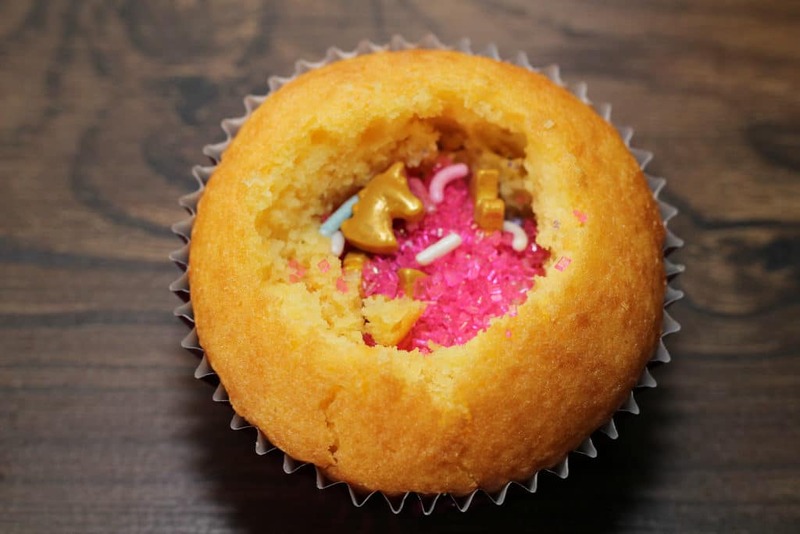 Fill the center of the cupcake up about 3/4 of the way full with sprinkles. Place the top back on the hole and press it down gently. When you think of cupcakes, you think of the cupcakes with the pretty swirl frosting on top. Many people are intimidated about how to swirl the frosting on cupcakes. it is actually very easy. All you need is an icing bag and pastry tips. You can even do it without the tip but it is a little harder and not as pretty. Fill the icing bag with the icing. 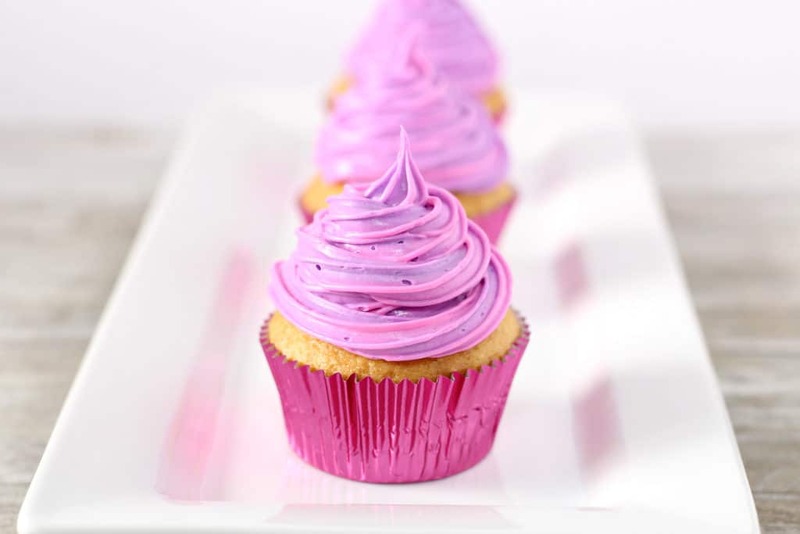 Since these unicorn cupcakes use two different colored icing, you will want either two icing bags, or decorate some cupcakes in one color and then clean the bag and start again for the other cupcakes. 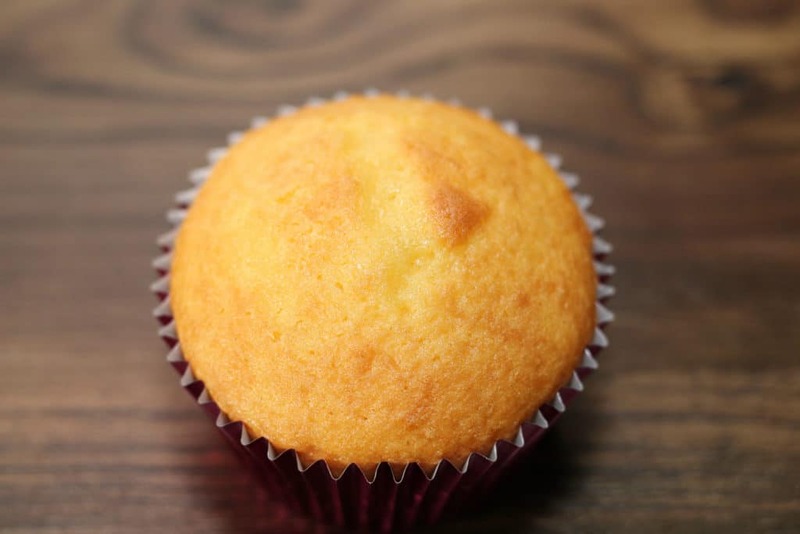 Add Flavoring: If you use a white or vanilla cake mix, you can add flavoring to the mix. You can create any flavor cake you like. Different Candies: We used sprinkles for our cupcakes with surprise in the middle. You can use MM’s or any other type of candy. To stick with the unicorn theme, use multicolored candies. Two Colors Frosting: Another way to frost the icing is to add both colors to the icing bag. Put one color on one side and the other color on the other side. As you frost the cupcakes, the colors will swirl together. Start by mixing your cake mix, eggs, oil, and water in a large mixing bowl. Mix until smooth. Line a cupcake pan with liners, and fill each liner 3/4 of the way full. Bake according to box instructions. Let cupcakes cool completely, now for the fun part. Cut the center out of each cupcake, and place aside. I use a spoon and scoop out the middle, about halfway down. Press down on the hole lightly with your finger to clean it up. Fill the center 3/4 of the way full with sprinkles of your choice. Place the top back on and gently press it down. Now when icing the cupcakes it is best to use an icing kit. 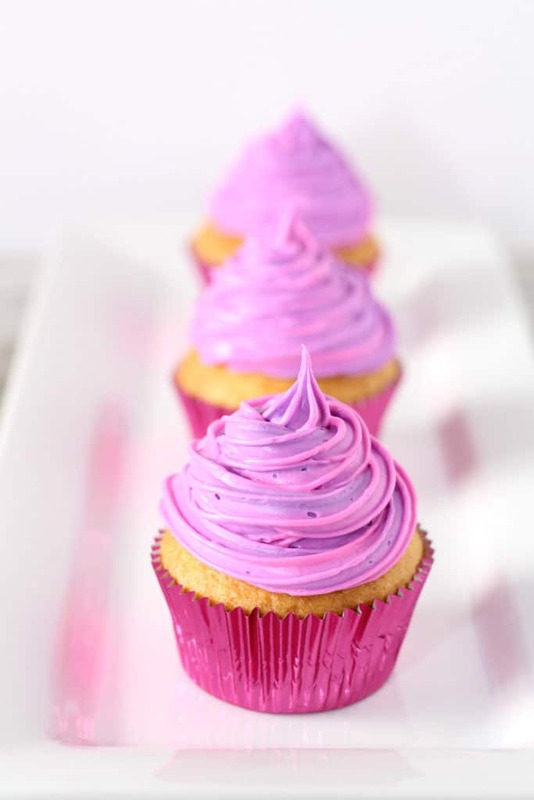 Fill one side of your piping bag with purple icing, and one side with pink icing. Ice your cupcakes as normal, whatever technique you choose. Want to make a special Unicorn Cupcake for a special occasion? 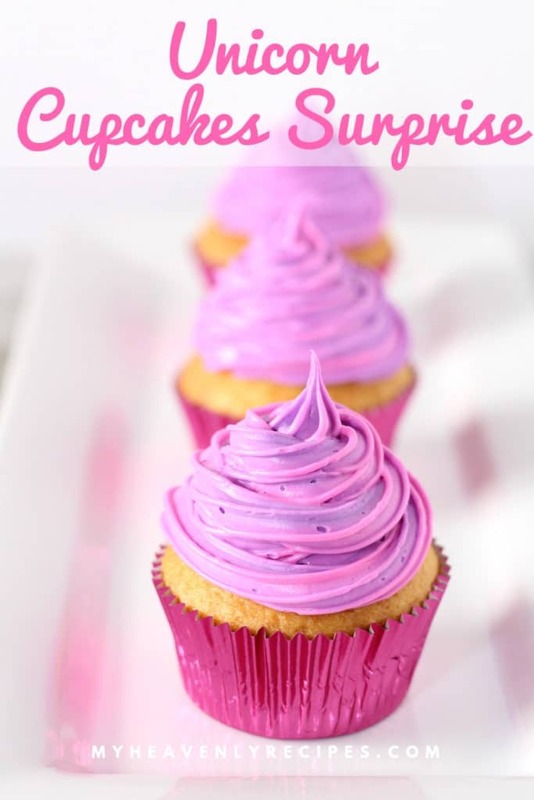 Try these Unicorn Surprise Cupcakes. Cut the center out of each cupcake, and place aside. I use a spoon and scoop out the middle, about half way down.